Llandudno's two new lifeboats have been officially welcomed into the RNLI's lifesaving fleet on Saturday. A dedication service was held for the all-weather Shannon class lifeboat, named William F Yates, and inshore D-Class lifeboat, Dr Barbara Saunderson. The new boathouse was also officially opened on Llandudno seafront. 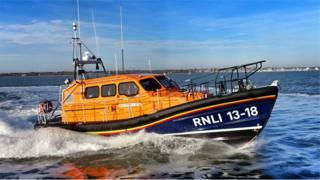 Afterwards, both lifeboats were launched to demonstrate their capabilities.